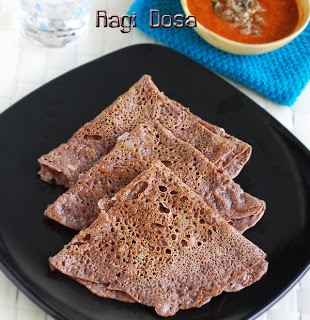 Ragi is one of the most favourite cereals.It is also known as finger millet .It is easy to digest and one of the most nutritious millet.There are many health benefits of ragi. 4.Reduces high glucose levels in the blood. 5.Acts as a good source of protein/amino acids. Ragi is used in many dishes to make,porridge,rotis,dosas.Its taste is different from wheat.Let us see how the ragi dosa can be prepared. 1.Take ragi flour,wheat flour,jeera,salt,chopped onions,chilli in a bowl and add enough butter milk or water to make thin batter. 2.Heat dosa pan,pour oil as we do for ravva dosa,cook both sides for medium flame. There are many good blogs for me to read. But this is one I like to read so much because it contains much useful information for me to get. Thank you. I am taking every day 1 glass of ragi jawa as break fast . I found I lost 2 kgs wgt but my doubt is their any side effects. New Diet Taps into Revolutionary Idea to Help Dieters Get Rid Of 23 Pounds within Only 21 Days! Nice and very informative article you can vist hair transplant in Chandigarh for information regarding hair transplant. Nice blog. Thanks for sharing this valuable information.